Hey all, another blog post for my Class of 2018 seniors! We are just a few short weeks away from graduation for all of the wonderful seniors that I have had the pleasure of photographing for the Class of 2018! I'm hoping I can get all caught up blogging them before then! We are so excited for them to head out into the world! I had so much fun with all of my seniors this past season, and Cailyn was no exception. Cailyn is a senior at Rogers High School. She has been a cheerleader for four years at Rogers and describes herself as positive, intelligent and strong. I would have to agree after getting to know her. What an amazing young woman! After having to cancel twice due to weather and personal reasons beyond control, we finally were able to do Cailyn's session over MEA weekend last fall. It turned out great, as the weather was beautiful and the fall colors were popping! Baylee did Cailyn's makeup for her, but she needed no help, as she is absolutely a stunning girl! Cailyn chose three locations for her senior photos. Rogers High School, Henry's Woods Park, and the Stone Arch Bridge/St. Anthony area of Downtown Minneapolis. She was going for a look where it really showed who she is as a person. Light, Happy and Fun. I think her photos do just that! Cailyn chose Rogers High School as our first location, because she cheered for four years and wanted to definitely do senior cheerleading pictures. It was a beautiful day, yet windy, but we were able to work with it! She brought her cheer poms as a prop because she really wanted to show off how much she loves and cares about the sport she was in. She cheered her whole high school career and loved being a cheerleader. Cailyn picked her next location as Henry's Woods Park in Rogers, Minnesota. I don't remember a more beautiful day at Henry's Woods. The fall colors were fantastic, one of the reason's Cailyn chose this location! We then headed to the Stone Arch Bridge area of Downtown Minneapolis. Cailyn picked this area because she loved the urban feel and look. St. Anthony is always one of my favorite locations. We took some photos at Mill Ruins Park next to the bridge first. This is always a popular location with local seniors. We then headed up on the bridge for "Golden Hour". 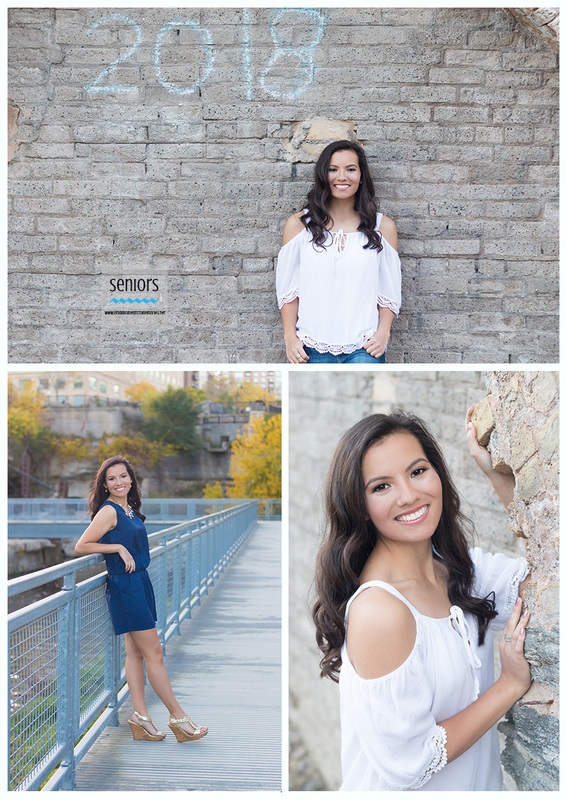 These are some of my favorite senior photos I've taken on the Stone Arch Bridge. We were having so much fun we literally ran out of time as it got dark so fast! Cailyn's advice for those preparing for their senior photo session? "Pick out outfits that you would like to wear and be comfortable in. Search for other locations where you would like to take your pictures at. Have some sort of vision that you would like to see happen and show off your interests. But most importantly is to have fun." Great advice, Cailyn! More advice? "Show your brightest smile to the camera, but really just be yourself and have fun!" And she did! I also asked Cailyn what her overall experience was with her senior session. Her response? "Overall it was such a blast! Sheila and Baylee were amazing and so helpful through the process. I had so much fun as being myself during the shoot. Loved the locations that I went to capture what I was looking for." What are Cailyn's plans after high school? Since our shoot last fall, Cailyn has received an amazing scholarship to Gustavus Adolphus. She also just won another scholarship from Rogers High School. Cailyn plans to major in Archeology and begin her journey into the real world with determination, enthusiasm, and curiosity. She wants to be an Archeologist and travel all over the world. Good luck in all you do, Cailyn! I know you will succeed in reaching your goals!